HotelClub is a leading global accommodation website offering hotel and accommodation bookings for up to 12 months in advance. HotelClub provides consumers with over 48,000 accommodation choices in over 5,600 cities worldwide throughout 126 countries. Their services are available in fourteen languages including: Chinese (Simplified & Traditional), English, French, German, Italian, Japanese, Korean, Portuguese, Spanish, Swedish, Polish, Thai, Russian and Dutch. 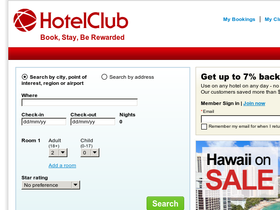 HotelClub delivers discounted hotel rates all year round - up to 60% off normal hotel rates. Save on your next purchase with HotelClub discounts, HotelClub coupons, HotelClub promotions and HotelClub savings from 58coupons.com. Get on over to HotelClub.com to save 70% on hotels worldwide. Click link for details. Sign up for your free membership at hotelclub.com and receive member dollar rewards, prizes, exclusive specials and more! Click link to sign up now.